I confess I am really not good in applying eye liners. I always prefer to go for pencil liners or gel liners. Even if I use liquid liner, I make sure the tip is felt tip for easy application. I have always liked Oriflame The One range and I was intrigued to try it when I saw this liner has felt tip. 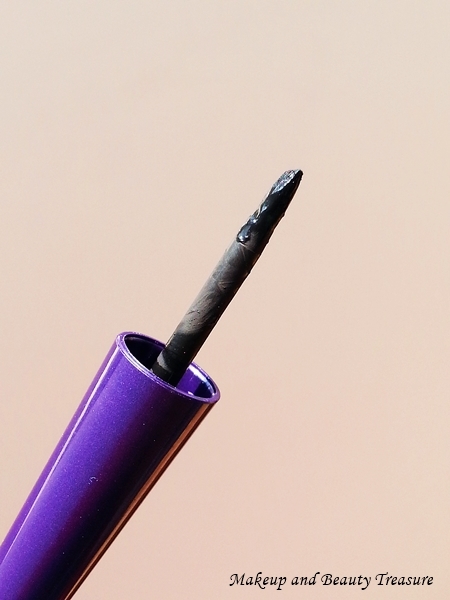 The unique thing about this liner is it has slightly slanted tip that made me curious to try it! Oriflame The One Wonder Eye Liner costs Rs 499 and you can BUY ONLINE HERE at Rs 355. Hope you can see the slanted tip! This is a single swipe! The packaging of Oriflame The One Wonder Eye Liner reminds me of my favorite Faces Beyond Black Long Stay Liquid Liner. The long tapered handle allows to grab the liner comfortably whilst application. The brush has felt tip that is slanted. 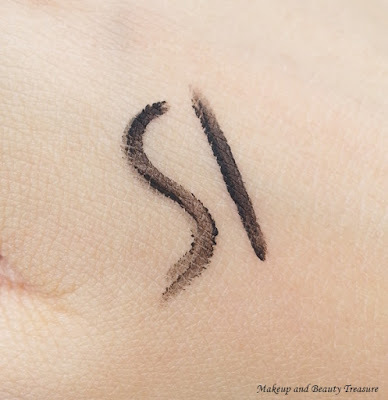 The formula of the liner is slightly weird and I find it difficult to draw a line in one swipe. You can look at the swatch. 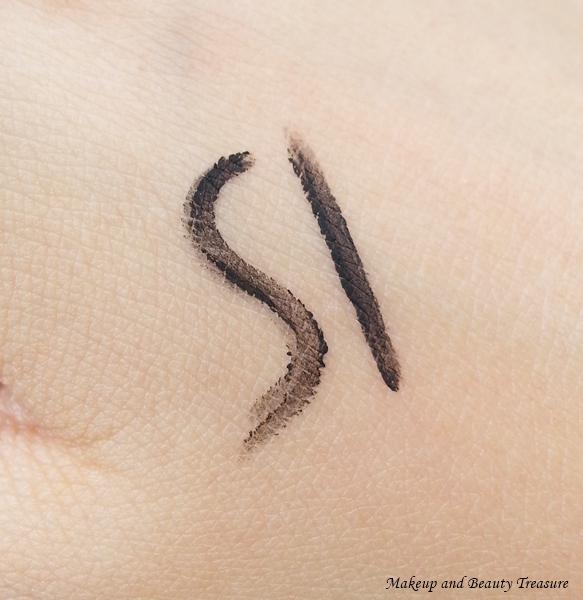 The pigmentation is quite low and you do not get a solid line with one swipe. The slanted tip does not allow me to create thin lines. As I am not an expert in applying liners, I find it very difficult to create a smooth line. It dries fast so I don't have to wait for ages to apply mascara. I have slightly oily lids but I have not faced any smudging or smearing issues. Mind you guys this liner is not waterproof and comes off easily with water or makeup remover. Make sure you do not use it in monsoons and look like a live panda *laughs*! - Love the color of the packaging. Purple has always been my favorite! - Though it is not waterproof but it stays on my lids for the entire day! - Does not smear or smudge! - Brush is slanted and difficult to control. - Pigmentation is not good! - Very difficult to use if you are first time users! The slanted tip of Oriflame The One Wonder Eye Liner is definitely not my cup of tea! I always find it difficult to apply eye liner neatly. The pigmentation is not that good and you have to go over the line again to get true color. It might be great for people who are expert in applying liners but I would definitely not recommend it to first time users! - To apply smooth line, always wipe the excess on the opening of the tube. - Do not use it in monsoon season or you are planning to go in contact with water. - It is difficult to apply this liner close to the eye lashes. In that case tight line your eyes using eye liner pencil! What is your favorite black eye liner? I've got it last month and I liked it pretty much for its Very unique wand style..The wand is so so perfect to apply a smooth and thin or thick line as per preference. I loved the shade also. its a lovely black shade which Settles into matte finish.